For other uses, see Ilansky. 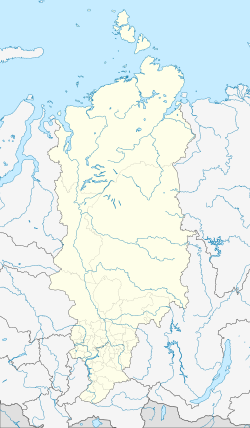 Ilansky (Russian: Ила́нский) is a town and the administrative center of Ilansky District of Krasnoyarsk Krai, Russia, located on the Ilanka River 279 kilometers (173 mi) east of Krasnoyarsk. Population: 16,111 (2010 Census); 17,073 (2002 Census); 18,409 (1989 Census). It was founded in 1645 as the village of Ilanskaya (Ила́нская). Town status was granted to it in 1939. Within the framework of administrative divisions, Ilansky serves as the administrative center of Ilansky District. As an administrative division, it is, together with the village of Algasy, incorporated within Ilansky District as the district town of Ilansky. As a municipal division, the district town of Ilansky is incorporated within Ilansky Municipal District as Ilansky Urban Settlement. Законодательное собрание Красноярского края. Закон №13-2898 от 28 января 2005 г. «Об установлении границ и наделении соответствующим статусом муниципального образования Иланский район и находящихся в его границах иных муниципальных образований», в ред. Закона №10-4571 от 29 апреля 2010 г. «О внесении изменений в Закон края "Об установлении границ и наделении соответствующим статусом муниципального образования Иланский район и находящихся в его границах иных муниципальных образований"». Вступил в силу через десять дней после официального опубликования. Опубликован: "Ведомости высших органов государственной власти Красноярского края", №5, 7 февраля 2005 г. (Legislative Assembly of Krasnoyarsk Krai. Law #13-2898 of January 28, 2005 On Establishing the Borders and Granting an Appropriate Status to the Municipal Formation of Ilansky District and to Other Municipal Formations Within Its Borders, as amended by the Law #10-4571 of April 29, 2010 On Amending the Krai Law "On Establishing the Borders and Granting an Appropriate Status to the Municipal Formation of Ilansky District and to Other Municipal Formations Within Its Borders". Effective as of ten days after the official publication.). This page was last edited on 16 September 2018, at 18:29 (UTC).